Fatwood has been used in the South for many, many years to describe the amount of pitch (resin) in pine wood. Approximately 8" in length and 3/4" in diameter, fatwood is made from splitting the stumps of pine trees that contain a high concentration of natural resin. This organic, 100% natural resin allows the Fatwood to be started with a single match and gives a sustained flame. Our sticks are 100% natural with no chemicals or additives, making them a user and environmentally friendly product. 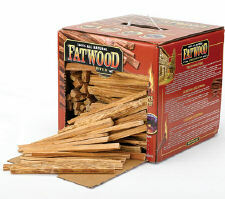 Fatwood offers a safe, simple, and mess-free way to start any fire and is used in fireplaces, pellet fuel stoves, barbecues, wood/coal stoves and campfires.